PERFECT QUALITY - we use for production Hair Cutting Scissors high quality surgical grade stainless steel for Hair Cutting scissor is tempered with precise blades and hand-sharpened cutting edges to evenly trim hair with ease. 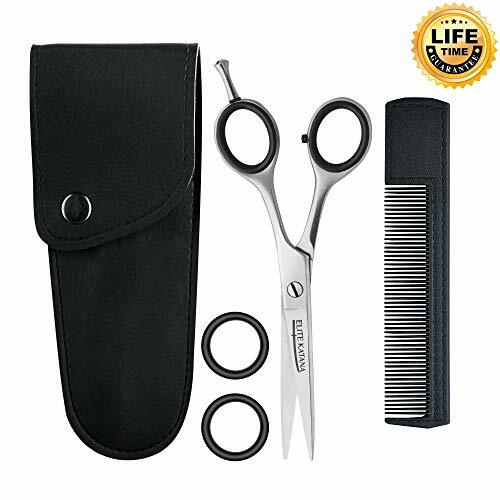 EASY TO USE - Our Hair Scissors is great for salon workers, barbers, hair enthusiasts and personal usage as well. Its distinctive easy grip handle design allows the Hairdressing Scissors to cradle fingers and also comes with thumb and finger removable inserts for Sizing Adjustments, delivering a confident haircut every time! SAFE - Hair Cutting Scissors are safe and easy to use on men, women, the elderly, children, and babies. With a sleek stainless steel and mirror polished texture, our hair scissor reduces messy hair clutters as no hair gets caught in between its blades. If you have any questions about this product by ELITE KATANA, contact us by completing and submitting the form below. If you are looking for a specif part number, please include it with your message.